You likely have all the ingredients handy to whip up a batch of Homemade Taco Seasoning. Once you see how easy it is to make a batch, you’ll never purchase pre-made seasoning packets again! Yesterday I posted a recipe for a delicious Taco Soup. The recipe called for a packet of Taco seasoning, with an option to use a homemade taco seasoning. I thought it might be helpful to post a recipe for the homemade version, in case you don’t have your own favorite recipe. There are hundreds (thousands?) 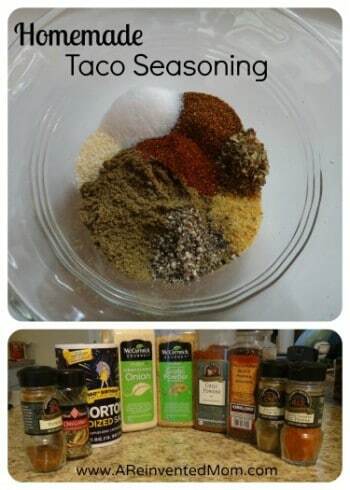 of homemade taco seasoning recipes floating around Pinterest and the internet. Today I am sharing my recipe. I arrived at my current version after trying quite a few different recipes, ultimately adjusting the ingredients and quantities until I got it just right. 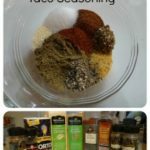 I don’t know if you’ve checked the labels on your favorite taco seasoning lately, but there is some yucky stuff included in those little packets – ewww! If that’s not motivation enough to make your own seasoning, I don’t know what is. Plus, it’s realllllly easy to mix up a batch of the homemade stuff. So easy in fact, you will wonder why you waited so long to make your own mix. You likely have all the ingredients handy to whip up a batch of Homemade Taco Seasoning. Once you see how easy it is to make a batch, you'll never purchase pre-made seasoning packets again! Mix until spices are combined. Makes the equivalent of 1 seasoning packet. - If you are doubling/tripling/etc. this recipe, I recommend using table salt (i.e. Morton's). Kosher salt is fine for a single batch. - This recipe is easy to make in bulk. I typically make a quadruple batch and store it in a tightly covered, small mason jar. Use 2 tbsp. of seasoning mix in place of a seasoning packet. - Nutrition Disclaimer: All information presented on this site is intended for informational purposes only. Any nutritional information shared on www.AReinventedMom.com should only be used as a general guideline.